It looked like Sam Chelanga was ready to press the pace. 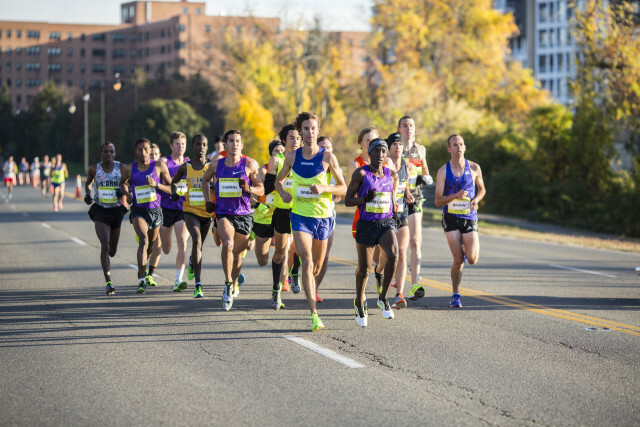 The lead pack – more like the entire elite field – was approaching the two-mile mark, stretching across George Washington Memorial Parkway, when the 30-year-old moved out front and took control of the national 12k championship this morning. Turns out it was just a test, or more like a suggestion. “I was just trying to instigate the guys to go faster but they didn’t want to do it,” said Chelanga. So he slowed down, the pack again enveloped him, and Chelanga steeled himself for the final three-quarter-mile long straight shot to the finish. Even then there were still at least 10 potential winners. But as one kick led to another kick, and as that kick led to a sprint, Chelanga finally found himself out front for good, able to hold off Tyler Pennel by a fraction of a second to win his second national road title in 34:35, a pace of 4:39 per mile for more than 7 miles. The Kenya native and recent U.S. citizen had in fact been there as recently as last month, when he outsprinted Pennel to win the 10-mile championships in Minneapolis. “It is always good to go home knowing you ran through the line, you gave it your all,” said Chelanga. 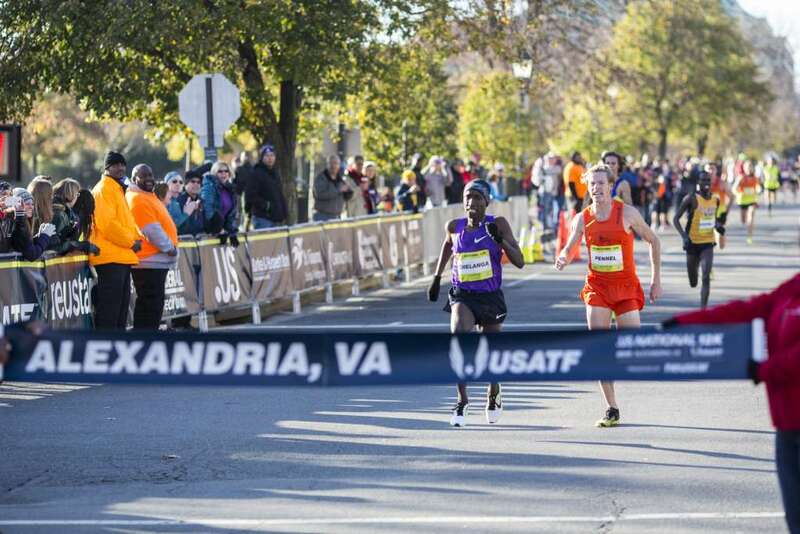 [button-red url=”http://www.areep.com/events/usatf12k/2015/” target=”_self” position=”left”] Results [/button-red]This was the .US National 12k championships’ third running since USATF and Neustar partnered to launch this event in Alexandria. Previous renditions have pitted runners peaking specifically for the race with runners still recovering from fall marathons. But with the marathon trials ahead, fall marathons were skipped. Meanwhile, most members of the field were united in seeing the road ahead of them as part of the longer road to trying to make an Olympic team. The marathon trials are in February in Los Angeles, while the track trials will be held in July in Eugene. “I would have liked to win. That’s why I’m out here,” said Pennel. The Blowing Rock, N.C.-based runner added, however, that today’s race was the latest indicator that he is entering the buildup to the marathon trials in a good place – mentally, physically, and developmentally. “You run for third, you can get fourth. If you run for the win and get third, you still make the team,” he said, describing what will be his approach to the trials. Defending champion Brian Shrader, of Flagstaff, Ariz., figured the marathon focus was part of what kept the early pace slower than in the first two runnings of the 12k. The leaders went through the opening mile in the low 4:50s, as opposed to 4:40 in previous years. Shrader’s own shift at the front, which came after the turnaround of the out-and-back course, was inspired by seeing the now-three-time 12k winner Molly Huddle opening up a huge lead. “She has a 50-meter lead already. It’s like, we need to start actually racing. … So I tried to throw in some surges to make it more of a race,” he said. Shrader’s efforts did lower the pace closer to 4:30-per-mile for much of the second half of the race, yet a big lead pack remained intact. “It was comfortable the whole time,” said Shadrock Kipchirchi, who finished third in just his second road race in 34:37. But this race came down to the final minute. And when push came to shove, the U.S. Army World Class Athlete Program member discovered, like others, that he “didn’t have that gear” to break the tape. Jim Spisak, who was fourth in an identical time to Kipchirchi, came to the same conclusion. Spisak trains in Rhode Island as a member of the nonprofit New England Distance Project, which supports elite athletes in exchange for them contributing to community programs (he provides tutoring in math to middle and elementary school students), and is coached by Kurt Benninger, husband of 12k champion Molly Huddle. “With about a half mile I tried to move but just couldn’t go with them,” said Spisak, referring to Chelanga and Pennel. Shrader came through in fifth, two seconds behind Spisak. Since winning here last year Shrader has not created headlines, so to speak, but he did set personal bests at 5k and 10k, qualified for his first national championship (something he never did in high school or college), and has his sights set on the track trials. Shrader’s training partner, Diego Estrada, national half marathon champion, was seventh in 34:46, and, like Chelanga, is preparing to make his marathon debut at the trials. Then there was Aaron Braun, of Alamosa, Colo., who won his first national title here in 2013. Last year, in trying to defend his title, he led the whole race until the final quarter mile. “This year my plan was basically to do the exact opposite,” he said. And true to form, Braun could often be seen flanking the lead back, in a way running his own race. Braun expressed appreciation for this still relatively new event. Neustar and USATF are at the end of their three-year agreement, and Braun said he hopes the 12k will continue. It was great, for sure, for Jared Ward, who won the national marathon championships in March and finished sixth today to win the 2015 USATF Running Circuit, in which American runners earn points by competing in various national championships. “Today was about one more opportunity to have a good race and learn something about me and learn something about the other guys I’ll be competing against in the [marathon] trials,” Ward said. D.C. area runners were keeping pace with the nation’s best today and will seek to do the same come February. Though he was not listed as an elite athlete, Chris Kwiatkowski, of Washington, D.C., was in the thick of the lead pack until 10k. Tyler Andrews of Arlington was 18th in 36:39. Andrews said he was coming out of a big block of training. And before he starts focusing specifically on the marathon trials, he has one more race to tackle: none other than the world 50k championship, in less than three weeks. The race also played host to the national masters championship, won by 49-year-old Kristian Blaich in 39:29. McLean’s Philippe Rolly finished second, leading the Baltimore Washington Athletic Club to the 40+ title. Playmakers Elite/New Balance won the 50+ team title, the Boulder Road Runners won the 60+ title, and the Shore Athletic Club won 70+.